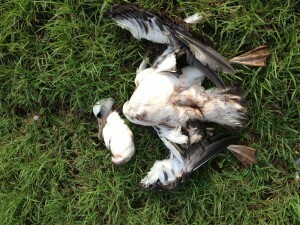 LIHU‘E – The Department of Land and Natural Resources (DLNR) is issuing a reminder to pet owners to keep all dogs on leash, after three Laysan Albatross (or Moli) were killed on the North shore of Kaua‘i this weekend in the latest incident where albatross have been slaughtered by loose dogs. The dead albatross, which have only just started returning to Kaua‘i after many months out at sea, were found by tourists walking near Moloa‘a Bay. 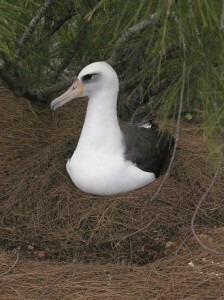 The Laysan Albatross is listed as near threatened under the IUCN Red List and is a federally protected species. They have only recently recolonized Kaua‘i after a lengthy period of absence and their population has slowly increased on the island in recent years. They face a number of threats including by catch in long-line fisheries, ingestion of plastics and predation by introduced mammals, particularly dogs. In recent years there have been a number of incidents where dogs have gotten into albatross colonies and killed large numbers of nesting birds. Two of the three birds were marked with unique identification codes. One, KP341, was a male bird that had been banded in 2007. It was one of a pair of albatross that are known to be the first pair to lay their egg on Kaua‘i each year. The second bird, P009, was banded at the Pacific Missile Range Testing Facility on the South Shore.